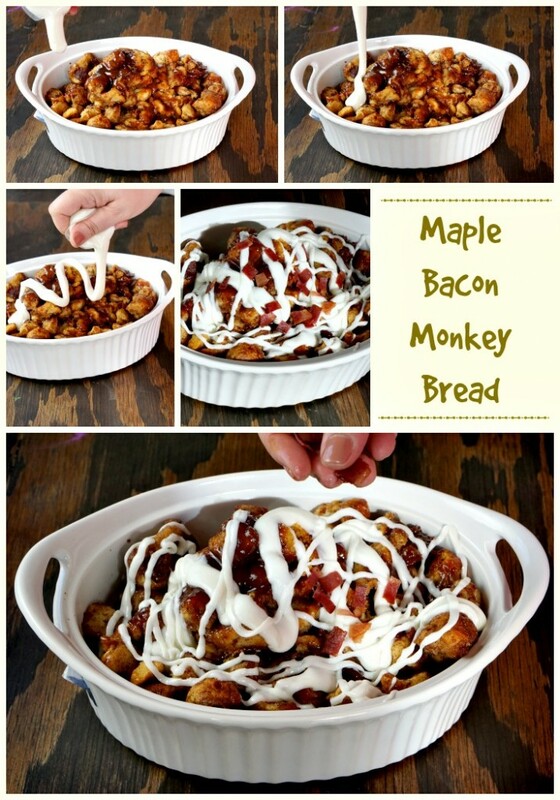 Maple Bacon Monkey Bread. Think about that for just a moment. Say those four words over a couple of times in your head… Yum, right? 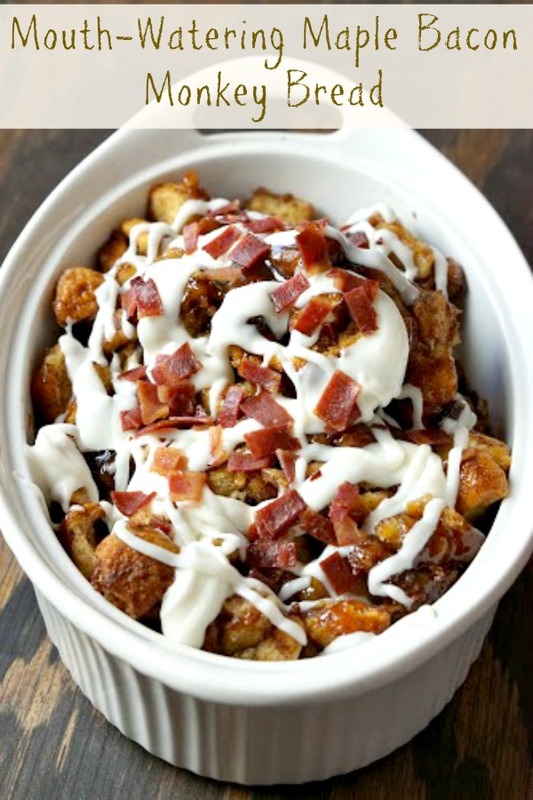 I’ve always said, “Everything is better with bacon!”, and then add maple and monkey bread in the mix and you’ve got a heavenly combination. I love sweet and salty together and savory desserts are one of my favorite things for breakfast. Okay, for any time. The flavor combination is amazing and it’s also a great recipe to let the kids help make. 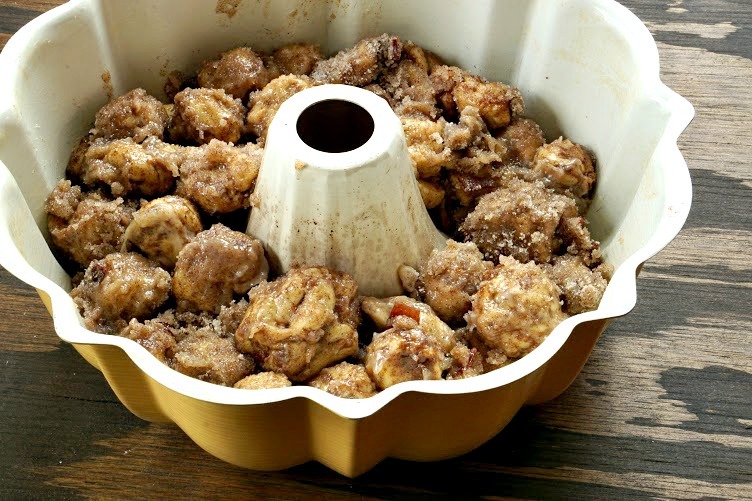 This twist on traditional monkey bread will blow your mind! Spray a bundt pan with cooking spray and coat with flour. Mix bacon, sugar, and cinnamon in a large bowl. Pour into a large zipper bag for later. Cut cinnamon rolls into 4 pieces and roll each piece into a ball. Combine butter, brown sugar, and maple syrup in a small bowl. Place the balls into the butter mixture then dip back in the bag with dry ingredients to coat. Arrange evenly in the bundt pan. Bake on 350* for about 30 minutes. Allow to cool for about 10 minutes. Place a plate over the bundt pan and flip over. If all of the bread doesn’t come out you can piece it together. Drizzle cream cheese over the bread and sprinkle with bacon. This version of monkey bread is so delicious, easy, and perfect for breakfast or as an anytime snack. I think it just might be my new weekend treat. Remember, if you like this post, please take the time to follow all my projects and finds here on Pinterest. 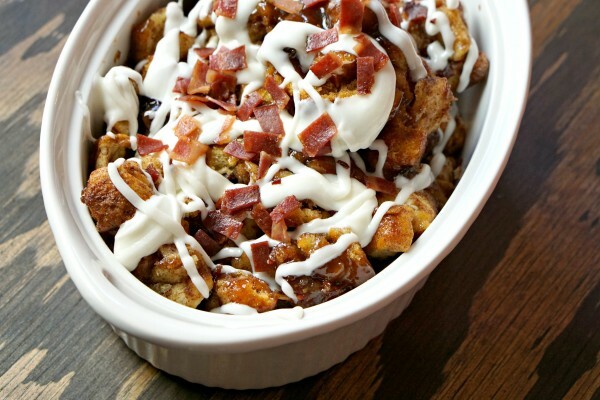 You can also pin this Maple Bacon Monkey Bread recipe for later. If you click through a link(s) and buy something, I’ll earn some money, so thank you. Bacon and bread are two of my favorites :). Thanks for sharing this recipe Donna. I’m going to have to try this one!